Home A & E Archer’s Back, Baby! 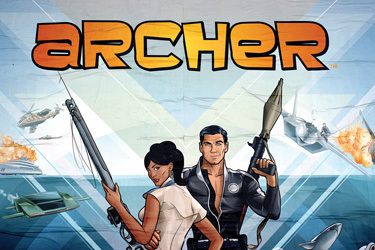 The last season of FX’s hit TV show Archer was, for lack of a better word, wily. Wily even for Archer. Instead of focusing on the usual violent international antics of Sterling Archer and his deadly co-workers in ISIS (don’t worry; not that I.S.I.S. ), causing a ruckus worthy of an international incident almost every episode, the series painted the portrait of a spy agency in the throes of poverty after being disgracefully shut down by the U.S. government. Normally this, coupled with narrowly avoiding multiple treason charges, would be more than enough to convince any spy to find a new, simpler day job. Or at least take some time off for some serious self-evaluation. Not Archer and the gang. Instead, the recently disbanded gang of spies banded together and turned to the literal metric ton of cocaine locked away in Mallory Archer’s office in a last ditch attempt to walk away with some serious cash. The season even took on a new name: Archer Vice. Unfortunately, due to ISIS’s incompetence and Pam’s Cookie Monster-like affinity for cocaine, most of the product ends up lost, stolen, or eaten (yes, eaten). However, the whole fiasco is ultimately revealed as a plan concocted by the CIA to liquidate the cocaine and use the profits to buy weapons to arm a rebel group fighting the government of San Marcos. By some act of God the CIA allows ISIS to reform at the end of the season, but as a branch of the CIA instead of an independent agency. Also, guess who’s the surrogate father of Lana’s baby? If you guessed Cyril… you literally (“is it literally or the other one?”) guessed the exactly opposite person. It’s Sterling Archer. In typical Sterling Archer fashion, season 6 begins with the protagonist shirking his newfound responsibility in a horrifically trashed hotel room in Thailand. He summarily receives a call from his mother-boss Mallory Archer, who assigns him a new CIA freelance mission in Borneo. The mission marks another 180-degree turn in the series’ premise, away from the organized crime of the last season and back towards the spy agency adventures of seasons past. The one key difference in the new season is ISIS is an affiliate organization of the CIA, meaning they have to work directly with the government on every operation. Their collaboration is bound to amuse and entertain. Can ISIS handle that extra layer of oversight? Do they possess the willpower to keep their nose clean? Were the hookers in Archer’s hotel room ladies or lady boys? Only time will tell. For now, the first episode of season 6 marks a crude and hilarious return to the show’s incessantly awesome humor by capitalizing on opportunities for cruel practical jokes and over the top action sequences in exotic locations. By slightly tweaking the premise of the series, the fifth season proved that Archer’s brand of humor and storytelling can avoid stagnation and remain in sight of the media’s ever shifting attention. With inevitable clashes with the CIA and Archer’s struggles with fatherhood approaching, I would not write this season off by a long shot.